Listening to our friend Larry itemize his stash of "just in case" supplies for a hiking emergency was a fascinating journey into our own past when we realized how very differently we and he approached the problem. We'd all 3 grown up in the Pacific NW; are about the same ages; all had had some recreational hiking experiences spread out over decades, and yet we were relying on very different strategies and gear to help ourselves in a difficult situation. The more we chatted, the more I realized that we were the one's who had wildly deviated from the conventional wisdom he was following and yet we were very satisfied with our well-considered approach. Larry's kit was patterned after the usual assumption that one should be prepared to spend the night alone in the wilderness after a mishap and wait to be rescued; our kit was shaped by the expectation that we would drag ourselves in for the night, one way or another. Larry's approach had resulted in him having little concern for the extra weight and bulk of his emergency items, figuring he'd be glad to have them if in a jam and that the excess weight aided in his conditioning. Our strategy was instead focused on speed and strength, which meant keeping the weight and bulk of our gear to a minimum and expecting endurance to contribute significantly to extracting ourselves from the most common predicaments. Larry's kit contained an abundant supply of cord and a tarp for making a shelter as well as matches or a lighter and cotton balls impregnated with Vaseline for starting a fire--all of which are considered essential and none of which we carry. Our ponchos and pants for rain and foam sit mats for picnic comfort would however give us a good sitting-up-styled bivouac in a pinch but we carry no fire starting supplies or material for constructing a shelter. My experience on Outward Bound in Minnesota as a teenager completely soured me on the notion of a day hiker relying on a fire in an emergency situation, which is why I don't carry the needed items. The program's planned, overnight survival experience in the wilderness vividly demonstrated to me how extremely difficult it is to find enough fuel to keep a fire going when alone in the dark in a damp forest. On that 'solo' experience, I succeeded in starting a fire with my ration of 3 matches but was so frustrated after a few hours of feeding it that I dowsed my fire rather than be a slave to it. It wasn't raining, I was fully able-bodied but the process of running around looking for more suitable fuel before the fire went out wore me down. It isn't hard to imagine that having an injury that prevented one from walking out would make it almost impossible to sustain a fire based on my experience, though being lost is a different situation. Being prepared for a hiking emergency is a form of insurance and one's investment in any insurance should be preceded by the same general evaluation: determine the most likely hazards, estimate their relative probabilities, assess the potential harm of each, consider your personal tolerance for those risks, and then determine the price you are willing to pay to insure yourself against the multitude of risks. Bill and I rekindled our hiking careers while in Europe where the chance of getting lost or being totally alone is quite small, so the "out alone all night" scenario became less important for us to insure against. And when we starting hiking in the US SW in 2011, we still felt our need to prepare for overnighting in the wilderness was small because of where we hiked. In Europe, the biggest threat to our safety usually was not reaching the cable car before it closed for the night at 4:30 or 5 pm or perhaps missing the last bus back to our mountain village. Gradually we understood that speed was the most likely way for us to prevent an emergency bivouac or walking down off the mountain in the dark. It was while hiking in Europe that we committed to being able to maintain a sustained light jogging pace over rough terrain while going uphill at elevation to prevent an emergency, hence the emphasis on lightweight gear. Our years of overseas cyclotouring resulted in us having lightweight, compact, highly functional gear when we began hiking in earnest 5 years ago. Our small, 18 L backpacks were selected because they are featherweight and wad into small balls, important qualities for items that spent more time stashed in panniers than working on the trail. They have no padding, no zippers, no pockets, and not even a top--they are sturdy sacks with contoured straps and a draw cord. Bill's multi-tool is the smallest one he could find with pliers for pulling cactus spines, our flashlight is tiny, as is our camera and 3"-long pens. We can be prepared for a wide fluctuation in weather conditions and counter the most likely emergencies with a small, light load largely because of the strong bias towards minimizing weight and bulk when on a bike, a bias which lets us be fast on the trails too. Talking with Larry underscored just how much our clothing choices when hiking have been influenced by being cyclotourists. Like Larry, we didn't go out and buy hiking costumes (which is very "done" in Europe) when we started hiking more often but grabbed what was already in our closets. For Larry on a late summer hike, that meant cotton jeans, a cotton polo shirt, and a cotton sweater, and a non-waterproof jacket. He was quick to admit that he'd be cold from the sweat on his clothes if he had to overnight in the woods and wasn't adequately prepared for rain. We too hike wearing what's in our closet but we threw out all of our cotton-ware when we began cyclotouring and replaced it with various weights of highly breathable, wicking, technical fabrics. Staying warm in cool to cold weather on the bikes when we sweated so heavily was a huge problem that we spent years solving. Now we consider these same garments components of our safety equipment when hiking because we know that we will not get chilled from our own sweat if we must slow down or stop. We might not have enough clothing with us to be comfortable sitting overnight but we'd be warmer than if we were wearing cotton no matter what the season. Larry commented that he'd given up on waterproof outerwear because of the sweating problem: the "wet from the inside or wet from the outside" cyclist's dilemma. Fortunately there is a solution to that problem, which is wearing only tight fitting, wicking, breathable long john tops and bottoms under high quality, breathable waterproof jackets, pants, and socks. (Two-way zippers and 'pit zips' on the jackets helps too). It's an expensive solution but we considered it worth the money to be warm, dry and hence safe in a range of conditions and activities. And to really keep dry, we always wear a poncho over the jacket when in a downpour on the bikes or on foot. We find wearing a poncho over us and our packs is the easiest way to keep our gear dry when hiking in the rain. I also carry lightweight water repellent mittens to keep my hands dry if there is a chance of rain. I gained new regard for our red cycling ponchos as emergency gear for hiking when in the SW the spring of 2012. At Joshua Tree National Park a volunteer described sitting out a brutal hail storm on a long desert hike and clearly the extra protection of a poncho makes them worth carrying for that remote possibility. A month later when we were approached by a Search and Rescue crew on the trail and heard their helicopter hovering above, I realized our near-neon colored, large ponchos would be an easy way to make our location much more visible to a rescue operation. And in addition, they add a noticeable bit of extra warmth when worn in the cold. Like our ponchos, we also consider our silly looking, wide brimmed sun hats as a part of our emergency preparedness gear. In the long term, they contribute to cataract prevention by blocking incidental light that comes in around our glasses but their waterproof fabric helps keep us dry on our hikes as well. And the wide brims are a huge help when dashing or hunkering down in a hail or wind-driven rain storm by protecting the eyes, glasses, and face. My wide-brimmed winter sunhat has fold-down fuzzy ear flaps that help my head stay warm, especially in the wind. Keeping warm and comfortable are the first steps for me in keeping my head right in difficult situations. For the above items and our backpack itself, we carry very minimalist gear that is lightweight and compact. Our whistles are embedded in the backpack strap; our flashlights are the size of a couple of dried apricots; and our extra clothing is all high-function for the weight and bulk. For years when we cyclotoured we carried a traditional first aid kit and extras like metal mesh for splinting a break but each year we threw out a few more items. For cycling the most useful first aid items weren't in the kit, which was soap and a toothbrush for scrubbing grit out of 'road rash' that typically doesn't bleed enough to cleanse the nasty abrasion. We learned that the usual essentials like Bandaids are really a luxury that didn't contribute much--a piece of tissue and tape will suffice in most situations; for a more serious wound just use a bigger wad of tissue or cloth and more tape. Antiseptic ointment isn't usually necessary when out for a day--just cleanse the wound well. And usually profuse bleeding and water will provide sufficient short term cleansing anyway. Sport tape can be torn, you don't need scissors for it but they are handy. So for wound management, we rely on our stash of multi-purpose tissues and sport tape and that's it. Our first aid kit has moved away from an assortment of items for wound care to medications for easing discomfort and improving our ability to maintain good speed for getting in for the night, whether hiking or biking. Keeping the level of physical distress to a minimum helps keep one's problem solving skills at their best. Anti-diarrheal's will stop diarrhea as well as treat less troublesome but often painful abdominal cramping. Antihistamines will ease the distress from an allergic reaction, also making it easier to keep the feet moving. And ibuprofen will help bring down the swelling and associated pain from a tissue injury or a bonk on the head. These are the most likely hazards we encounter when hiking and the ones we are most careful for which to be prepared. We've convinced ourselves that a good supply of wide athletic tape and a length of an exercise band provide highly versatile remedies for an assortment of problems with a minimal space or weight penalty. Either one can be wrapped around an injured knee or ankle to give support to keep walking or used to make a sling for an injured arm. They also provide a means of making a repair to a failing backpack or pair of shoes. We've never had to employ the tape on the trail but know it works well from self-treating non-emergency sport injuries. In the "know too much" category, we also carry epinephrine to counter an anaphylactic reaction, which is a fatal suffocation that can occur with an allergic reaction. It's most common in people who have become allergic to bee stings but what few know is that anyone can convert to having a fatal allergic reaction to beestings and all sorts of other environmental toxins. It's rare, but we know someone who had just such a reaction after eating a meal on a boat in China, which got our attention. The time you have to get life-saving treatment is measured in minutes, not hours, so we go prepared for this highly unlikely but highly fatal reaction--it's that risk management equation. Delaminated boot sole high in the Austrian Alps. And certainly in the US, we are always carrying photo ID, our health insurance card, and a credit card as important "extended care" emergency items when hiking. Apparently one of the first requests from the EMT's doing helicopter evacuations from the Grand Canyon is for your credit card to immediately bill you the $3,000 fee for their services. And having your ID and insurance info handy will keep things moving smoothy at the ER. Something that is rarely talked about as a hiking safety issue but we've directly and indirectly witnessed a half dozen times on the trails is boot soles delaminating from the upper. We've been on the trail when someone discovered the problem and been at the trailhead when the unhappy backpacker finally made it back as well as seen several boots and soles discarded on the trail. I jokingly mentioned the recent sighting of someone with the problem to a Swiss hiker at a summit and he said it had happened to him as well. And one story I read about a rescued hiker in the US included a delaminating boot in the saga, so it happens. And it doesn't sound like spending more money will guarantee not having the problem. Including duct tape, or something better if you can think of it, in your kit to repair a delamination would be smart And checking your boots, especially at the tips of the toes before leaving home seems like a wise practice. We presume the sport tape we carry would do the job on our light weight shoes. 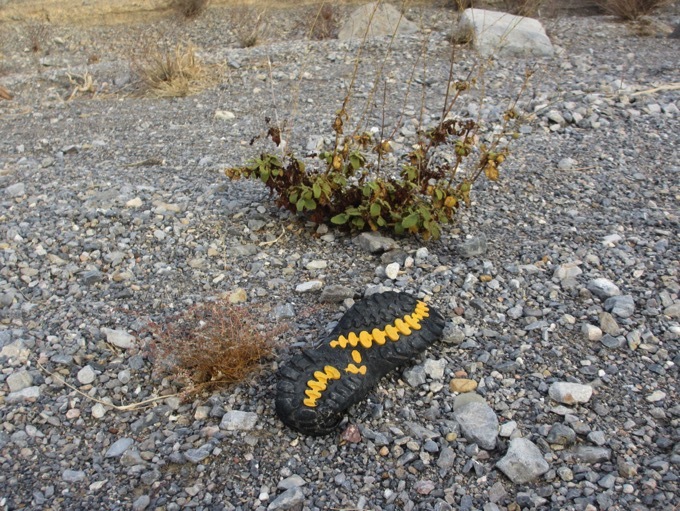 This delaminated boot sole was in the depths of Death Valley. In 2012 I was testing 5 different new minimalist shoes on the trails and always worried that one of the thinner or cheaper products would tear apart when hiking. My minimalist shoes were so thin and light that I decided that I could carry a spare pair in my pack for a back-up. We chuckled at the luxury of having a spare pair of "boots" in our small packs but I took a lot of comfort in it, especially on long hikes. When I hike alone, I still carry a spare pair with me even though I haven't had any catastrophic failures of my minimalist shoes. And when Bill and I hike together, we each carry one of his pancake-flat, Soft Star shoes that are essentially leather moccasins with a thin Vibram sole. Far from perfect, I could wear his shoe in a pinch, so we slash the overhead of carrying spares by toting 1 pair for the 2 of us. And though many think that we are absolutely crazy for dabbling with barefoot hiking, being able to hike barefoot is the ultimate back-up for a boot failure. We aren't hardy barefooters that can traverse anything all day long, but if the stretches of gravel, snow, or spiny debris are short, we could hike barefoot comfortably for hours though perhaps at a slower pace than normal. GPS is wonderful, but like the manufacturers' say, don't count on it. We often hike in canyons, gorges, deep valleys, and forests, which disable the GPS system, rendering it next to useless part of the time. 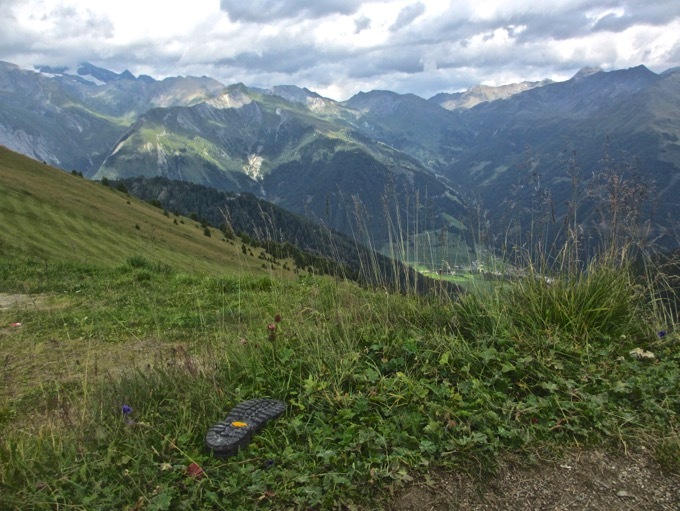 Turn-off your cell phone to conserve the battery's charge when hiking. If you are in a poor or no-coverage area the phone will voraciously consume battery power attempting to find service so it's best to leave it off until you need it. Also, in cold weather keep your cell phone warm to conserve the battery's charge. We use inexpensive, pre-paid (no contract) cell phones and when hiking we each carry one phone though one is served by Verizon and the other is served by AT&T to increase the odds of having coverage in more remote areas. Giving voice to our diverging strategies for safety on the trails with Larry turned out to be a useful journey of discovery for each of us. Larry decided to begin shifting his hiking wardrobe to better moisture-management garments and more effective rain gear. He also concluded that it was time to lighten his load a little bit by eliminating unnecessary, duplicated items that had accumulated in his pack over the years. We realized we should replace our high-intensity but tiny bike lights with small, low-intensity flashlights that would operate for hours longer than ours. Our "walk out" strategy wouldn't require bright light but we might need something that would last all night. Cable ties also popped into mind as yet another ultralight, compact, multifunction item that could be useful in making a repair or splinting a limb. Further debriefing a few days later had Bill and I realizing that there was an overlooked difference driving our respective strategies: no one ever knows where we've gone hiking. Unlike Larry, whose wife knows where to tell the rescuers to go looking for him if he doesn't return home at night, no one would immediately notice that we've gone missing. No doubt a long-forgotten reason why we have focused on walking out rather than waiting for help. Bill recognized that our situation was a perfect reason to have a 'personal locator beacon' but we were sorry to see that the most effective ones are in the $300+ range. Too expensive for a nice-idea gadget and the service provider still expects to chat to someone who knows where you are, we'll get one if we start taking our hikes in more isolated areas. Reflecting on all of these pro's and con's of emergency hiking gear underscored what is never said: one's kit should be customized to your situation. REI considers sunscreen and sunglasses essential items but folks hiking under heavy tree canopies in the Columbia Gorge of the Pacific Northwest would often consider that laughable whereas glacier trekkers are hobbled without sunglasses. Fire starting supplies don't do you much good if you primarily hike above tree line like we do when overseas or when hiking in the rain. But in the Lake Tahoe area where pine needles, pine cones, and dead scrub are tinder dry, a lighter or a few matches are all that would be needed to get a rip-roaring fire going, and since open fires are illegal there, making a fire would likely trigger a prompt rescue. If we continue hiking in areas like Tahoe, I'll 'eat crow' and add a magnesium fire-starting bar to my kit and be quick to alter our kit in other ways to match our hiking locale. Bill and I were still ruminating about hiking emergency preparedness after talking with Larry when a lecture on Search and Rescue (SAR) operations in Yosemite presented itself. Our usual resistance to being out late and gambling on the price of admission were overcome by the timeliness of the topic. Recently running so many 'what if scenarios' made the opportunity for potentially well-targeted information irresistible. Fortunately the director and 40 year veteran of Yosemite's SAR program took the opportunity to educate the audience rather than only dazzle us with accounts of SAR heroism or ridicule those rescued hikers and climbers who had made bad choices. Much of what he said added welcome depth to what we already knew, like part of the reason raging stream waters are so dangerous is that the white water is half air and so people cannot float in it like is possible in unchurned water. He also gave numerous examples of hikers becoming trapped, and some dying, while searching down steep faces for a lost trail. As we've learned in numerous gentle lessons, descending on steep, unmarked terrain is highly likely to result in not being able to proceed up or down. In addition to nicely filling out familiar concepts, we left the presentation with a new sense of clarity about several points. One was that our red ponchos were precisely what a search helicopter hopes to see. And better yet, he recommended always wearing bright clothing when hiking in case you tumble on to a ledge or are in another situation where you can't pull out a bright object like our ponchos. Fortunately most of our jackets do double duty as cycling jackets, which we always buy in bright colors, though our shirts aren't as attention getting. The SAR director emphasized the obvious, which is moving out of the shade and into an open area if you hope to be spotted by a chopper. Additionally, he recommended making some sort of a distress sign. "SOS" formed by rocks or in snow were examples of distress signals but even making unnatural marks on the ground might help alert aerial searchers, such as forming a broad, straight line in sand or dirt. We were surprised to learn that in some localities yelling is an effective survival tactic. In cavernous places like Yosemite, the voice carries a long distance and some of their SAR operations have been triggered by visitors reporting yells for help. Listening to the SAR director's stories underscored the wisdom of another one of our simple strategies, which is to use backpacks with chest and waist straps. Our minimalist packs have 2 simple front straps that we appreciate for keeping our packs in place when jogging, scrambling over rocks, or on via ferrata routes in Italy. But we'd also concluded that the straps would improve the odds of keeping our packs, and therefore our emergency supplies, with us in a fall. One of the SAR operation 'clients' had lost his fanny pack in a near-fatal fall, with the loss of his last bit of gear compounding his serious problems. Another survival story we'd recently heard elsewhere was of a female trail runner who survived being swept downstream in a raging river but her water bladder backpack stayed on her during the tumbling and presumably it was because she had chest and/or waist straps. Bill's take-home message from the SAR presentation was to be more careful around fast moving water; mine was to research and presumably buy a high-end signal mirror to alert searchers to my location. And together we concluded that it was probably smart to wait for another round of technology advances before buying a personal locator beacon. All this talking about our hiking survival kit had us re-evaluating our emergency supplies in our truck, which is how we get to the trailheads when in the US. We resented giving up the space for stowing 2 sleeping bags in our vehicle but have been in the spirit of "doing the right thing." Then we added a dozen small bottles of water. We realized that stashing some of our excess of bulgur under the truck's back seat did double-duty by providing emergency rations too. Since it made sense to stash our excess bulgur in the truck anyway, we decided to add a small plastic bag of salt and an unopened bottle of olive oil. Bulgur is quite palatable soaked and need not be cooked; adding salt and oil to soaked bulgur would keep us contented for days if stranded. Topping the food supply off with one of Trader Joe's 'pounder' chocolate bars was a no-brainer and might be handy for other "emergencies" too. The Leatherman multi-tool in the glove box was one of the first things to go into our new truck and our bikes were one of the last items carried that were recognized for their survival value. Since we almost always have the bikes in the backseat when traveling out of state, we decided they should be useable for an emergency. We both now always carry the key to unlock them with us and have left a tire pump and pannier as well as our helmets and shoes in the truck. The bikes would only be useful in selected emergencies but making sure that the potential usefulness was realizable of anything routinely in the truck only made sense, which had us looking for other items that could become survival gear in an emergency. We realized that the camper's headlamp and vinyl rain suits that we carry to aid in putting chains on the truck in the snow could be very helpful in a vehicle-based emergency. The small tarps under and over the bikes in the backseat could be useful in a jam, as well as the short tow rope we bought. We are still looking for other items routinely in the truck that could be augmented a little to make them a lot more useful if we were stranded in our vehicle. The good news for outdoors-people rescued in the US is that in most instances SAR services are free, or at least prepaid. SAR teams rely heavily upon dedicated and enthusiastic volunteers to provide most of the boots on the ground whereas the supplies, coordination, and management end are financed by public agencies. The National Forest Service has its own SAR branches, as do local Sheriff offices and other regional organizations, all of which are funded by our tax dollars. However, the meter starts running if and when the SAR folks transfer you to the medics. We have both health insurance and evacuation insurance but listening to the SAR presentation in Yosemite left me wondering just how complete our overlapping coverages would be on the heels of a rescue situation. Freshly armed with 2 very specific scenarios, I called both providers inquiring about our coverage. The first scenario I posed was from this spring when Bill thought he'd had a heart attack in the Grand Canyon and the doctor at the Park medical clinic agreed. She recommended he take an ambulance to the Flagstaff ER for care. The second scenario was a true story from a Yosemite SAR operation in which a young man with a badly injured arm was plucked by SAR from the rock wall he was climbing. The SAR helicopter deposited him on the ground where the climber was transferred to an air ambulance helicopter for transport to Fresno at an estimated cost of $25,000-30,000. Both scenarios would have resulted in jaw-dropping out-of-pocket expenses for us even though our health insurance covers ambulance services of all kinds at 80%. After turning the crank on the details of the coverage (deductibles, "allowed" expenses), we would have personally paid 100% of the ambulance charges for transporting Bill from the Grand Canyon Clinic to the Flagstaff ER. The health insurance representative was happy to run the numbers for me on her estimate of an average air transport bill of about $40,000, such as for the climber injured in Yosemite. In that instance, she quickly determined that we'd be forwarded a bill for about half the amount, around $20,000. Disappointingly, a call to DAN (Diver's Alert Network), the providers of our evacuation insurance, revealed that it is trickier to use their product than we'd believed. In my second scenario in which the patient is transferred from the SAR rescue helicopter to the regional air ambulance in the field, they would have paid $0. Their coverage is strictly medical facility-to-medical facility and require a doctor's orders for ambulance service. So, if the injuries weren't life threatening and there was time to 'touch base' at a local clinic with a physician present at that moment, then DAN would cover the charges in full. But if the injuries were so serious that there was no time to stop by a clinic (or SAR was unwilling to play that little game) then DAN would not cover the transport at all. Another Catch-22 of the often despised insurance industry. With my 2 scenarios, we were double losers with our DAN evacuation insurance. In the SAR scenario, they likely wouldn't have paid at all; in the Grand Canyon scenario they would have paid at 100% but we didn't even think to call them at the time. We always thought of the DAN evacuation insurance as a "fetch from the field" product, not a medical facility-to-medical facility one. Fortunately, Bill overrode the doctor's advise to take an ambulance to Flagstaff and more importantly, his assessment was correct, so we only paid for gas for our truck when I drove him to the ER. But this disappointing exercise of running these 2 scenarios by our insurers was invaluable because now we have re-wired our understanding of our insurance coverage and how to best utilize it. At each level, advance preparation for a hiking emergency should include risk management. While we each trade-off the small monetary and weight premiums for carrying safety devices like a signal mirror and a whistle with the likelihood of them being needed and the heftier penalties for highly effective rain gear and wicking garments, we should also evaluate our insurance. Like with the the more tangible gear, you need to know how to utilize your insurance and know if you should be shopping for a different or additional product to match your level of risk adverseness. If sharing our journey has ideas bubbling up that you'd like to pass on to us, send them on through to us at info@velofun.us . Thanks. ..My brother commented that the short style of emergency road flares can easily be carried in a back pack and provide a fail-safe way to start a fire using almost anything under almost any conditions. And of course, they do double duty as a single-use signaling device too. ..By Christmas time our ongoing conversations had us caving in and buying some addition survival items for our day packs. We both added a signal mirror; a magnesium fire starting rod/bar; wax coated tinder; 10' of cord; and chlorine dioxide tablets to purify water contaminated by almost any disease-causing organism. We practiced with the signal mirrors and fire starter before stashing them in the water resistant survival gear pouch. And we'll be checking out road flares soon for possible inclusion in our kit. We'll only carry these additional items selectively during US hiking outings and not take them to Europe because they aren't well-matched for our hiking circumstances overseas.